As promised, this post on IIT KGP did not take that long. Reason : I have got broadband connection at home recently and this gives me flexibilty to work at any time of the day. Basically, I am an owl and am sure to b an insomniac in the not-so-far future, I don't get sleep early( Early here is 0000hrs), So all this work takes place at the devil's hour. Now about KSHITIJ'06. How did it all start? One fine tuesday, in mid-december, after the DSP lab my eye caught the view of the poster at the department notice board. I immediately decided, I wanna go there. I expressed this desire in the class, and asked if anyone else would be interested. No response for a week or so, except from Sandeep. Then Shrikanth informed me that Praveen, Of mechanical, is also interested. We met, and started off immediately. Six of us started off on 31st( or early 1st feb, the train was late), by coromandel express. The team comprised - Me, Shrikanth, Vamsi, sandeep, Praveen and Karthik(eie). We were received at KGP( the longest platform in the world - 1072.5mts), by Praveen's uncle. After rejecting the pathetic accomodation provided by the Organisers( 150 participants cramped into a sports room), we moved down to a nearby hotel - The park. 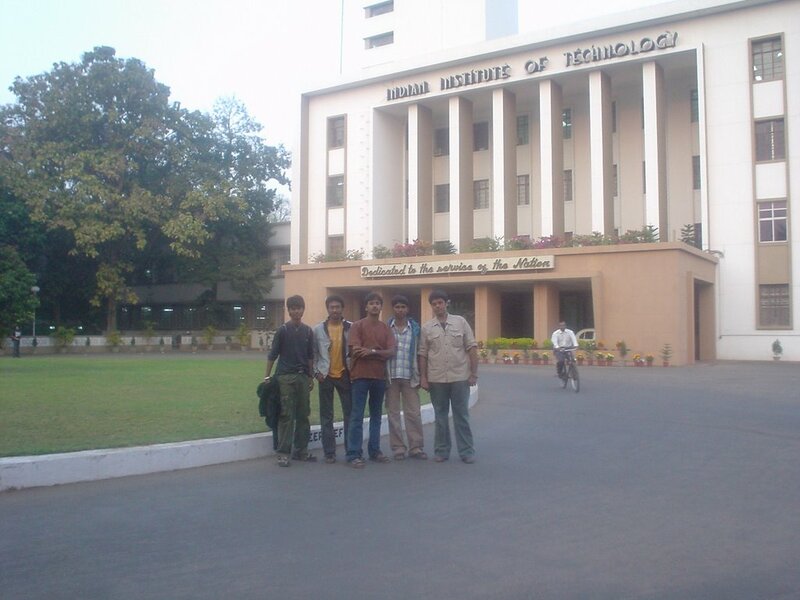 The first was all spent up in roaming around the huge campus( 700 acres), which we could'nt scale completely. We met some fellow vizagites of MVGR, who also ended up stayin at The Park. We had a sumptuos dinner, and also a peg of Vodka. Day ends. On feb 2nd. the fest was supposed to formally start at 5 PM today. we collected our Kits, and thought of goin away to nearby Kolkata today, but decided otherwise. We were given maps and, like foreign tourists coming to visit India, we were following the map to all the eataries in the campus. We saw the in-campus pool, The magnificient MMM hall of residence. In the evening at 5, we assembled at Netaji auditorium for the inaugral.There was a guest lecture by R. Chidambaram( The cheif scientific advisor to the govt. of India). Then we were witness to a mesmerising laser show by Manick sorcar( Son of the legendary magician, P.C. Sorcar). We then went to the arena to see the Robtix practise. Day 1 ends. On feb3rd. We registered for Nirmaan, and went to V! where our final presentation for Atelier. We done it well, but probably the judges thought otherwise, and decided that we deserved nothing more than a special mention. Sandeep was quite enthu to attend the worlshop on 3G technology, but we were more interested in seeing the rest of our competitors. I, vamsi and Sandeep formed a team and registered for El-Matador - A stock exchange simulation game. I and Vamsi even registered for Exemplar( A case study comp. ), which eventually did not cross the prelims even. We got selected in Nirmaan. The place that enjoyed the most was the TECH-QUILA tent. There was a caption tell competition where Sandeep and Shrik won a Digit mag each. 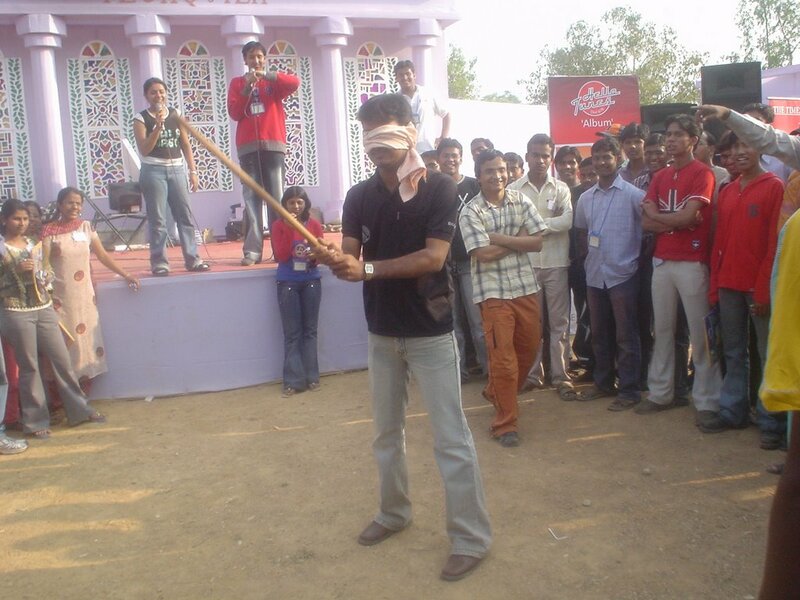 Then ther was a "Matka phod" comp. where i was the first participant. The host there blindfolded me and handed me stick with which i had to break a pot. I tried, but in vain. Nevertheless, she presented me a T-Shirt. We nade a car out of card-board, fevikwik, Rubberband( for the elastc force), etc.. and made it succesfully move for 8cms. Evening after the not-so-impressive Robo soccer, we retired to our rooms. Day 2 ends. On feb4th. We attended the Tech-quiz and were stumped at the prelims itself by those out-of-range questions. with such damping spirits, we did not participate in the BIZ-Quiz later in the day. The quiz qas being hosted by the famous quizmaster GP "pickbrain" Balasubramanian. We registered for Eureka, but did not care to attend it. Then we attended a humorous session by R. Gopalakrishnan, a IITKGP alumnus and presently a TATA guy. Then there was the HOT presentation by Partha Sinha explaining the nittigritties of Ad-making.We then participated in the Ad maknig show, where, once again, we were not able to cross the prelims even. All through I and Vamsi were trading for stocks, in the gaps. Evening, I and Sandeep visted the Tech-Market, and joined the others at TOAT for the enthralling guest lecture by nobel Laurete Prof. Klaus von Klitzing. Man, It was very humourous, and the laurete actually took out a wine bottle explaining his inclination to it, and his plans to party in the night. Coming to Party, that night even we had a rockin party, at the Disc at the TECH-QUILA tent. It was one fabulous party, and we danced non-stop for 2hrs. I, Vamsi, Shrik and karthik won a book on Network Computing. On the whole, the day ended on a high, and v topped it by gettin completely drunk. Day3 ends. On Feb5th. today, v did not have much to do, as all the preliminary rounds were over, and we had already collected our certi's. We attended an engrossing Workshop on Interpersonal Communication Skills, and also participated in Tech-Trix. We then ate some parathas, and were hanging around. We participated in the Ad-mad show, where we had to sell a Bamboo stick. Vamsi, Shrik, karthik and myself participated in this, and we won the third prize comprising a coke, and a chocolate each. We all then went to the Tech market, where I bought a T-Shirt for Jatin. We then went to the hotel and checked out. We sat at the garden-side restaurant till 9. We then set out to the station. Our train, the chennai-howrah mail, was fortunately at the right time. Day4 ends. Fest ends. we reached home on 6th, mon at about 1 in the afternoon. On the whole it was a fabulous experince, and i am looking forward for a chance to participate in other Fests. College life is really fun!! With this i sign off. U hav given the entire pic of Kshitij in detail.. gud... Hail ur patience.. Cool pic Bharat. 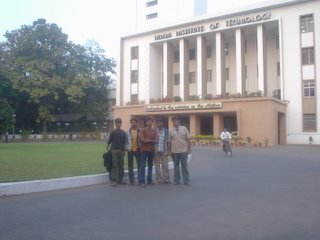 I went to IITKGP too, felt about its size the same as you do.